Although over fifty years old, this handsome Packard super 8 remains a daring concept of what a convertible should really be; big, elegant and flashy! 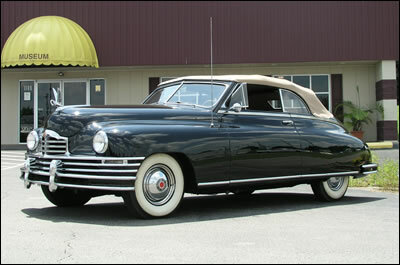 Every breath-taking inch of this car is Packard precision-built. With only 23,000 documented miles, this is an unrestored “original.” original upholstery, original black lacquer finish, original engine and drive train. This car was driven only sparingly before it was placed in covered storage. There it remained untouched for many years. This Packard is more than a museum piece. It is also a “driver.” handling is superb. It will journey all day at highway speeds. The ride? It is as gentle as silk and as hushed as a whisper in church. Power? It is hard to beat a big straight eight. This is a car that can be driven for the sheer fun of it.